Opening Reception: Friday, February 27, 5–7 p.m. The Anderson Foundation for the Arts (AFFA) is pleased to present an exhibition by Ian Boyden. “Nirvana” presents three monumental works of Boyden's recent ecological explorations, in particular our relationship to carbon. 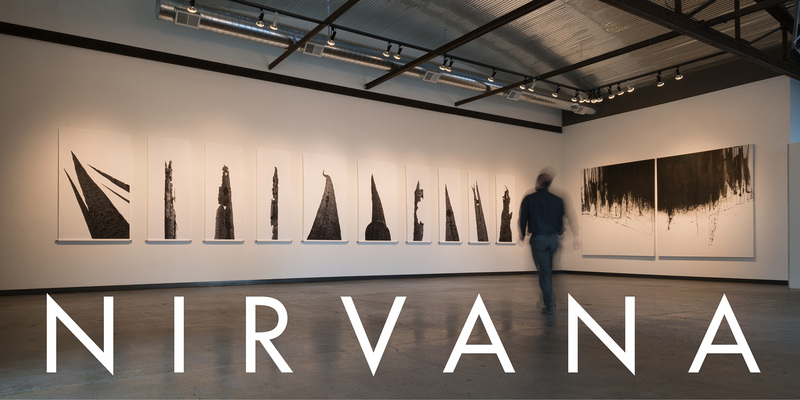 The title work of the exhibition, Nirvana, is an installation of carbon-based photographs of the charred remains of the Tripod Complex Fire that consumed 180,000 acres of forest in north-central Washington in 2006. The second work, Amorphous, is a single monumental painting five years in the making—a field of elemental carbon. The primary pigment used in Amorphous is amorphous carbon gathered from the Tripod Complex Fire, as well as soot from the chimney of his house, the smoke of ancient Chinese pine trees, and the dust of carbonaceous meteorites older than our sun. The third work, Dire Human, presents a wall of self-portraits facing the single skull of a dire wolf. The dire wolf went extinct at the end of the Pleistocene, roughly 10,000 years ago. Its remains have been primarily found in the La Brea tar pits, where the wolves became trapped in the pools of sticky asphaltum bubbling up from deep within the ground. Unable to free themselves from the tenacious grasp of petroleum, they died, their bones preserved in the carbonaceous liquid. Boyden sees these extinct wolves as a symbol of our own inability to extricate ourselves from oil dependency. Ian Boyden works across multiple media including painting, sculpture, artist's books, photography, site-specific installations, and land art. Boyden's work has been described as simultaneously geological, industrial, lyrical, and mystical. Linking the literary, material, and visual imaginations, Boyden pays keen attention to the relationships between his work and ecological awareness. Consistent across Boyden's productions is an intense interest in material relevance, place-based thought, and ecology, with a deep awareness of East Asian aesthetics. He studied for several years in China and Japan, and ultimately received degrees in the History of Art from Wesleyan University and Yale University. His work is interdisciplinary, and he often collaborates with scientists, poets, composers, and other visual artists. His work has been exhibited widely, including a recent solo exhibition in China at the I.M. Pei-designed Suzhou Museum. His books and paintings are found in many public collections including Reed College, Stanford University, the Portland Art Museum, and the Victoria & Albert Museum. 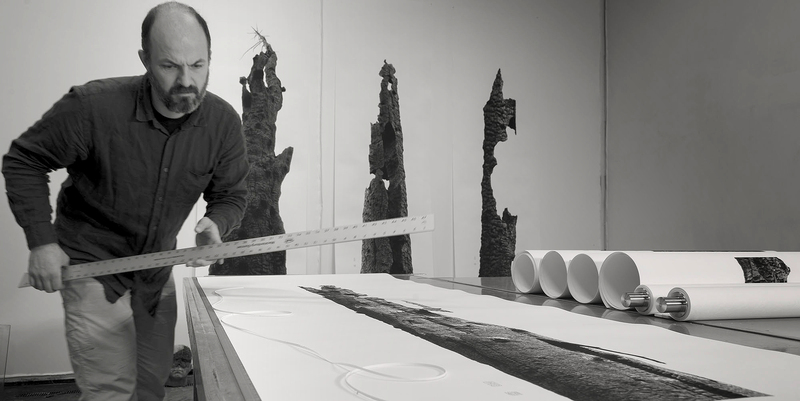 Ian Boyden binding the Nirvana scrolls, 2015. Carbon on paper, entire finished work 81 x 480 inches.